Salty desserts? Check. Bits of dark chocolate folded into chewy bars? Check. Bourbon? Check. Swirls of shiny, gooey sauce? Check. An easy one bowl crowd-pleaser that’s great for parties? Yes, please! The first time I ate a blondie, I was in my early twenties. It was early December & a friend of mine made a batch of these weird looking brownies and offered me one. I honestly had no idea that they were even a thing, so I had no expectations. On any given day, I’ll almost always choose chocolate over caramel, but tasting those blondies was a revelation. They were rich and nutty & far more complex than your average brownie. I immediately asked for the recipe and shamelessly baked them for every holiday party I attended that year. I mean, I love a brownie. But after even a small brownie, my quota for rich sweets is met, and I don’t want another for quite some time. Brownies are usually one note: chocolate. It’s a good note, of course, but it’s just one flavor. But blondies made me realize that there could be so many more notes. 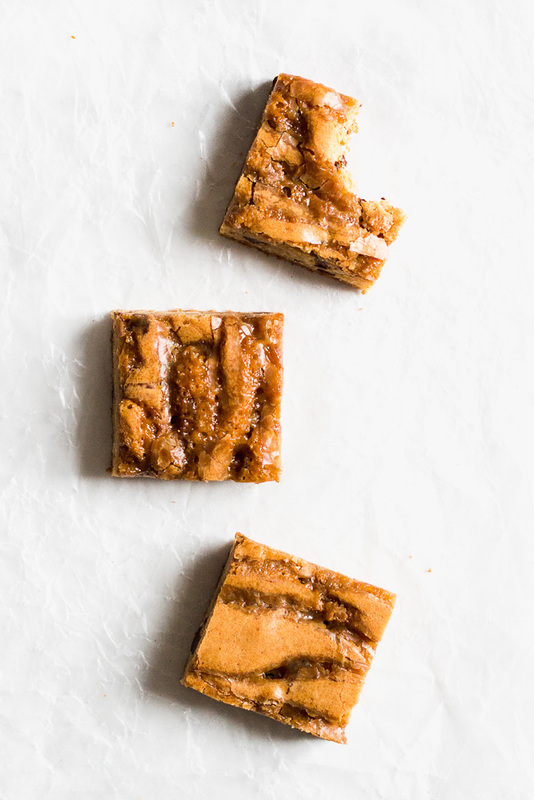 In a blondie, you get the vanilla, toasty-ness, the nutty flavor, and all that deep caramelization of brown sugar. Not to mention the add-ins in a blondie really get to shine. I think things like nuts, cinnamon, chunks of chocolate, and liquors get a bit hidden in a rich chocolate brownie. But in a blondie, there’s a complimentary relationship going on. The add-in flavors actually elevate the blondie without being muted. It’s really a beautiful thing. This blondie recipe makes a pretty typical blondie. Melted butter is mixed with brown sugar, eggs, and vanilla and then the dry ingredients are mixed in. Easy. Delicious. Standard. 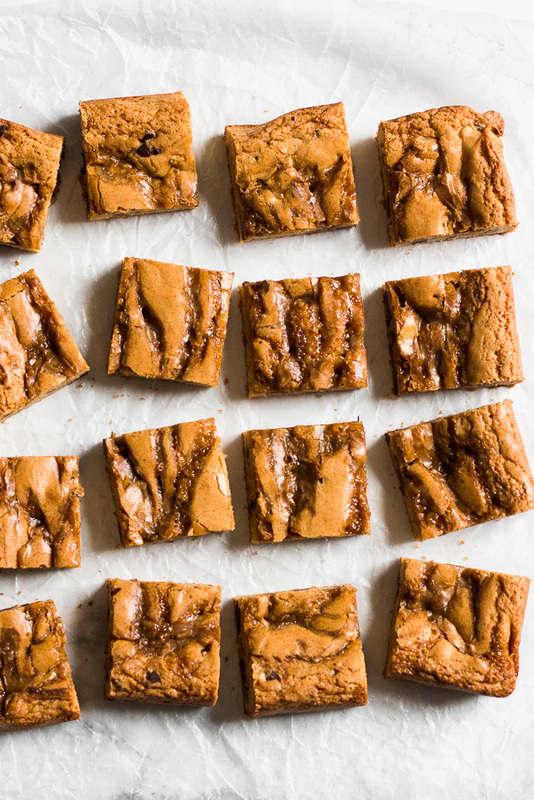 What really makes these little blondies extra special are two things: dark chocolate & bourbon butterscotch. The chunks of dark chocolate break up the sweetness and add a little extra texture to the chewy/soft blondie. 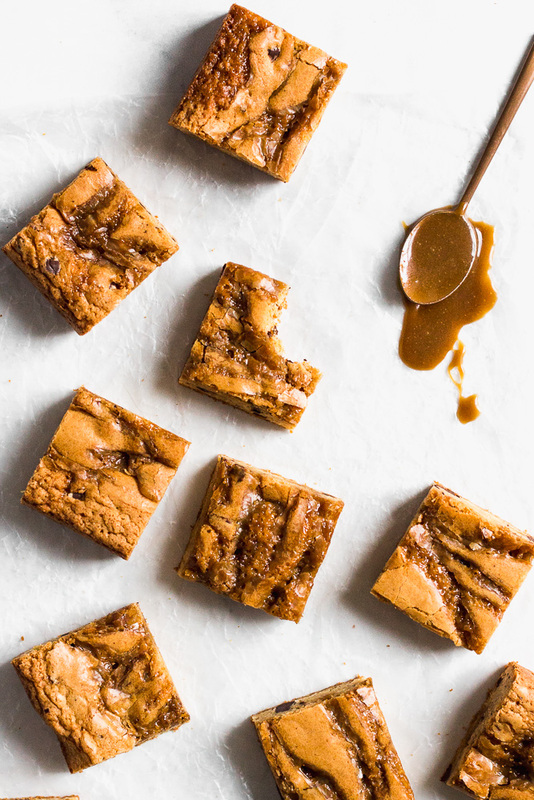 And the bourbon butterscotch adds a layer of deeper caramel flavor, a hint of delicious oak from the bourbon, some much needed saltiness, & a little extra gooey-ness. This recipe is made with home-made bourbon butterscotch sauce. This sauce is one of the most impressive things you can make in under ten minutes. All you have to do is add things to a saucepan incrementally and stir occasionally. That’s it. It’s rich & caramel-y, but the saltiness of the butterscotch cuts through the sweetness of the blondies beautifully. And that little hint of bourbon–it’s just dreamy. 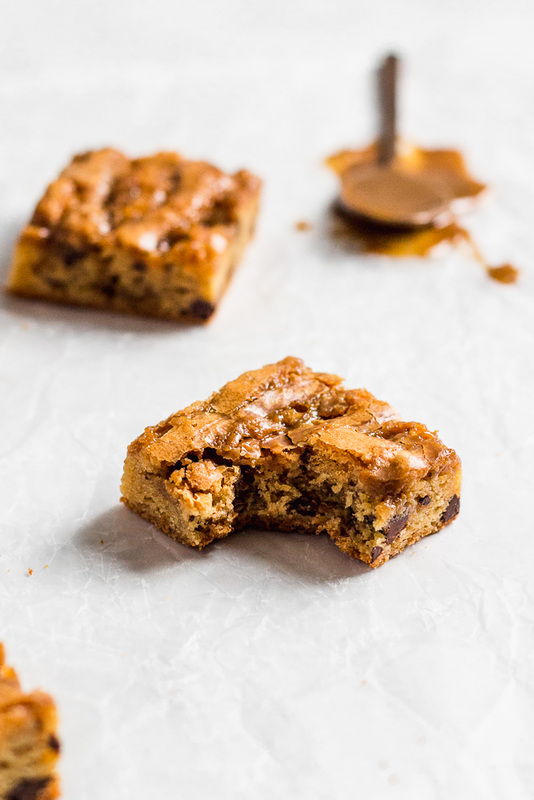 I think bourbon works perfectly with the caramel notes and dark chocolate in the blondies, but if you prefer (or if you just find yourself without bourbon) I think rum or brandy would be a lovely substitution. 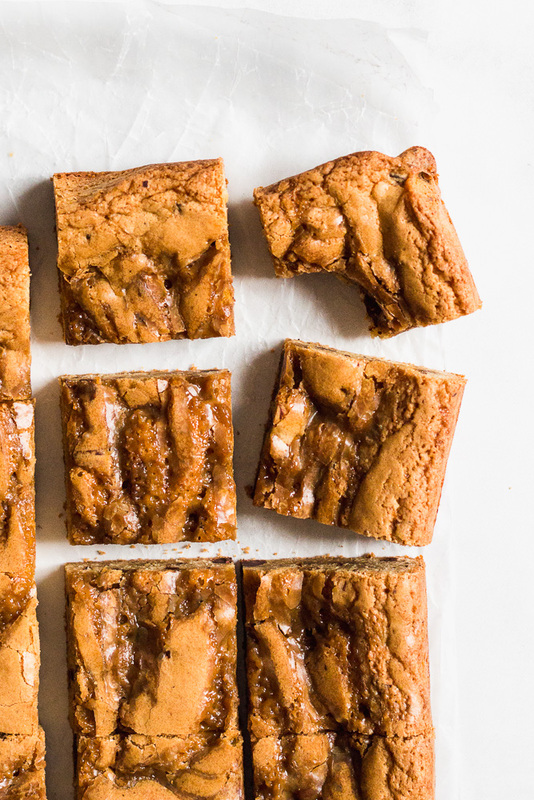 You really can’t go wrong, because at the end of the day, you’ve got blondies with homemade butterscotch and there’s really not much else that’s better. 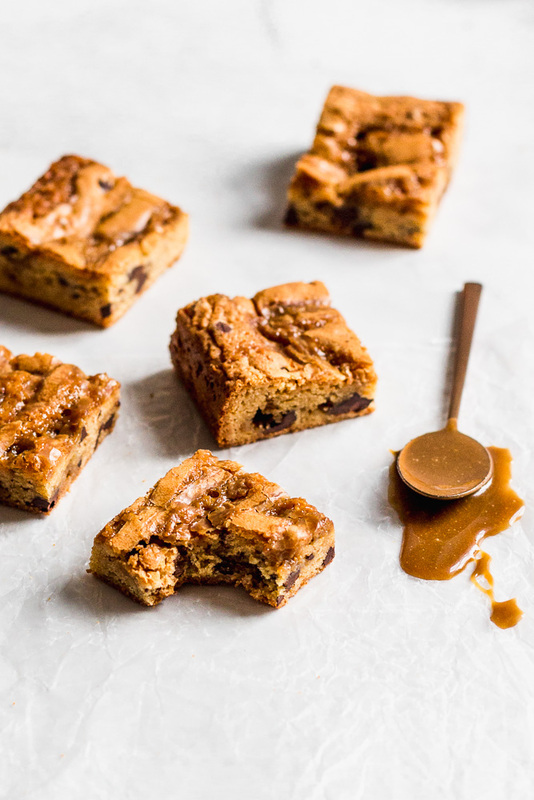 These blondies are full of dark chocolate chunks and swirled with rich & gooey home-made bourbon butterscotch sauce. They take 15 minutes to throw together & are the perfect thing for a party! First, make the butterscotch. In a medium saucepan, melt the butter over medium-low heat. Add in the dark brown sugar and flakey sea salt. Stir, with a wooden spoon or rubber spatula, until the sugar and salt have dissolved and everything has come together--about 2-3 minutes. Stir in the cream and vanilla and bring to a low boil, stirring occasionally. Cook until thick and syrup-y--about 5 minutes. Stir in the bourbon and let the butterscotch bubble for 2 more minutes. 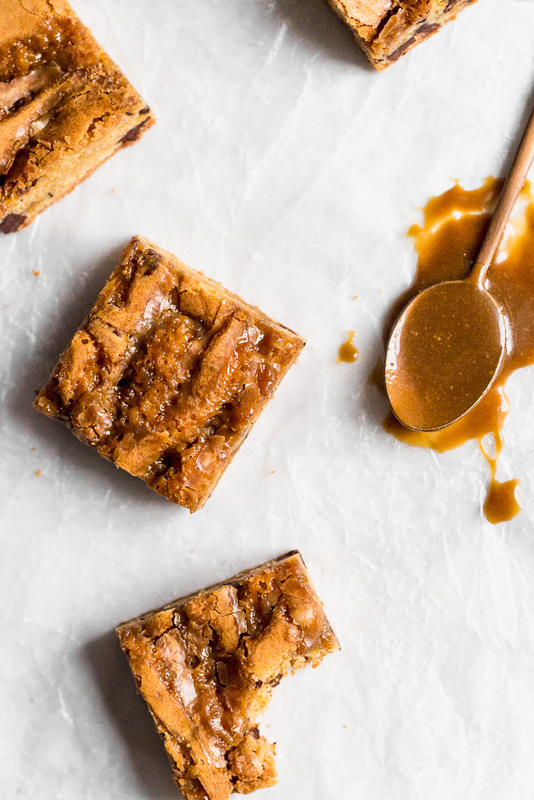 Pour the butterscotch into a heat proof bowl and let cool while you prepare the blondies. Preheat the oven to 350 degrees Fahrenheit. Grease and line an 8"x8" square pan. In a small mixing bowl, whisk together the flour, baking powder and sea salt. In a large mixing bowl, whisk together the melted butter, light brown sugar, eggs and vanilla. Add the dry ingredients into the wet and stir until just combined. Stir in the chocolate chunks. Pour the mixture into the prepared pan, making sure that you smoosh it into the corners and even it out. Drizzle thick dollops of butterscotch over the top of the batter. Using the handle of a spoon, or offset spatula, swirl the butterscotch around. Bake for 20-24 minutes. They're ready when the edges are set and the center is still slightly moist when you poke it with a toothpick. Remove from oven and allow to cool. Serve at room temperature or still slightly warm! 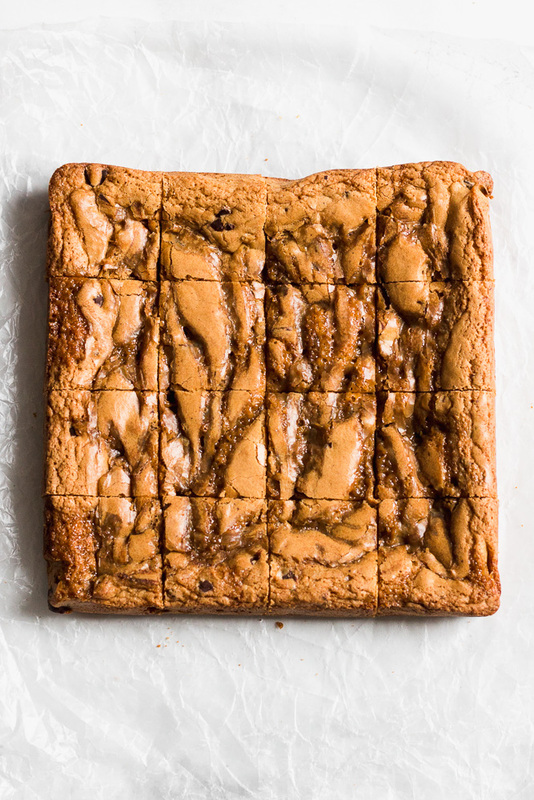 *This recipe for bourbon butterscotch will make more than you need for the blondies. You'll use about 1/2-2/3 of the batch. You can save the rest in an airtight container in the fridge to use on ice cream or whatever else you like! You had me at Bourbon. And butterscotch. And dark chocolate…these look mouthwateringly delicious!